When I made the home made Door County Cherry jam, there was about one cup of cherries, plus juice leftover. 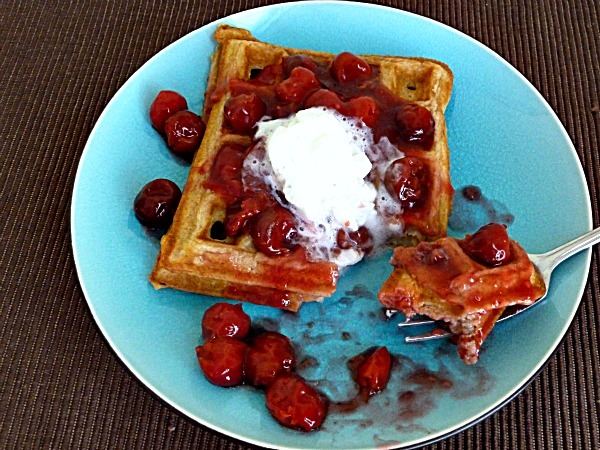 I was going to make small tarts, but my husband wanted Belgian waffles with Door County Cherry Sauce, so that's what we made. We had to fight over the cherry sauce though. Believe it or not I had never made waffles from scratch. These waffles were so light and fluffy, with the touch of cinnamon, and incredibly good. My hubby said that they were the best waffles that he had ever eaten. I think that it was the cherry sauce:) We will be making these again, maybe with strawberries or peaches, or even blueberries. Can't wait for fresh, summer fruit. I had to hurry and take this pic before the whipped cream melted! 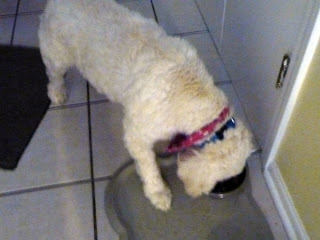 Usually, when we have pancakes or waffles, we give one to Bailey. Here is Bailey eating her waffle. I could never get a picture of her her face. She inhaled the waffle. In a medium bowl, whisk together the eggs, vanilla, buttermilk and butter until well blended. Combine the flour, baking powder, baking soda, sugar, salt and cinnamon; stir into the buttermilk mixture. In a separate bowl, whip the egg whites with an electric mixer until stiff. Fold into the batter. Do not skip this step. This is what makes the waffles so fluffy and light. Place cherries in saucepan and bring to simmer. Mix cornstarch into cold water and mix well. Stir in cornstarch mixture into the hot cherries, and continue stirring over medium heat, until thickened. Pour over waffles or pancakes, and Enjoy! Looks amazing - I would inhale them like Bailey! Thank you, Mary! They are so good! Wow now this is a waffle! Gorgeous photos mouth watering! I am secretly hoping my old waffle iron will give out because I do want a belgian waffle maker! I guess it is because I prefer fruit with waffles and they do hold up a lot of fruit. Your photo and plating is making me hungry! I am sure Bailey was hanging out in the kitchen waiting for his waffle. I am ready to have breakfast at your place after seeing this. I hope that you get a new waffle maker:) These waffles are wonderful with fruit. Bailey was sitting next to Scott, patiently waiting for her waffle. We always give her the last one. Thanks for your sweet words! It is so versatile, and yummy! YUMMY! Looks so tasty! I love homemade cherry jam too! 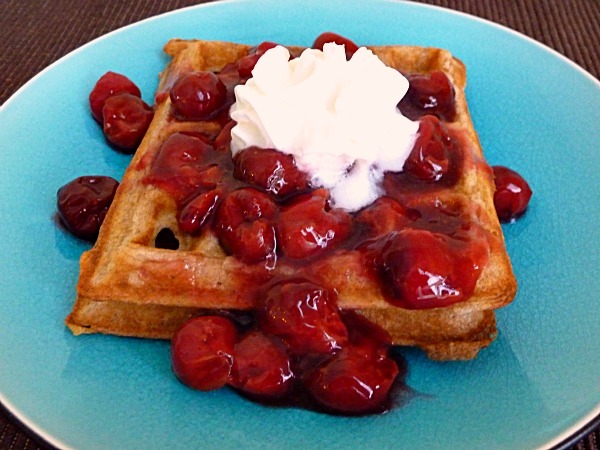 These waffles are so good, especially with the cherries. I'm with you. Waffles and fruit are so good together. Looks delish! I love waffles. Becky-I had to smile about your whipped cream, melting to hurry up and take the pic. Not as bad as trying to take a nice photo outside in the hot son, and cream melting as soon as you get started. Also, Bailey is so cute just eating up everything, can't blame her for chowing down the amazing waffles.